Ten days ago, Canada had never had a junior slam singles champion and Filip Peliwo had never won a match on grass. 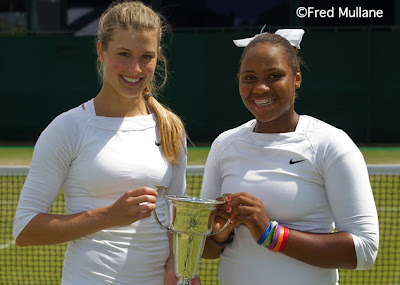 After Peliwo's 7-5, 6-4 victory over defending champion Luke Saville of Australia on Court 1 Sunday afternoon, Canada claimed its second junior Wimbledon title in the space of two days, with Eugenie Bouchard taking the girls championship Saturday. Bouchard's 6-2, 6-2 win over Ukraine's Elina Svitolina served as motivation for Peliwo, as did his losses in the previous two junior slam finals this year. "I was definitely, I won't say jealous of her, but that made me even more hungry," said Peliwo, an 18-year-old from Vancouver, who lost in the first round of the warmup event in Roehampton last week. "I just wanted to have the same feeling for myself and for Canada, to be able to win the slam. I knew it would be a great achievement if both girls and boys champions would be Canadians. That really inspired me. "The two previous finals I've lost, those are the biggest inspirations as well. I didn't want to lose again, but I wasn't letting it get into my head. I was just thinking about the match, not the past." 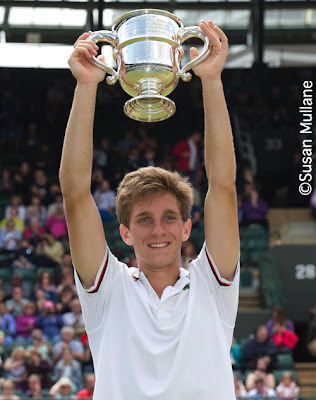 Peliwo trailed Saville by a break in the first set of the match, played in front of approximately 6,000 fans who had already experience several rain showers while making their way to the All England Club, whether to watch the boys final or the men's final, whether on Centre Court or Murray Mount. At 2-2, there was a black cloud and some rain, but the boys played through it, with Saville saving two break points, then breaking Peliwo for a 4-2 lead. Saville, the 2012 Australian Open champion, saved two more break points for a 5-2 lead, but Peliwo had been there before. In his 5-7, 7-6(3), 6-3 semifinal win over Mitchell Krueger on Friday, Peliwo trailed in 5-2 in both the first and second sets, and saved five match points, so he wasn't likely to go away. "I've heard around the ITF (junior) Tour, even the Pro Tour a little bit, that guys know that I fight no matter how far down I am," said Peliwo, who is 579 in the ATP rankings. "It's really worked for me in many situations." Not only did Peliwo get the break back, he broke Saville a second time to take a 6-5 lead, then, with the assist of a perfect offensive lob, held to take the first set. "If I could have kept my nerve and served half as well as I had the whole tournament, then I probably would have served out the first set," said Saville, who only had one ace, in contrast to Peliwo's five. "He broke me twice in a row, and I'd only gotten broken maybe twice in the whole tournament." Peliwo again trailed in the second set, after being broken at love serving at 1-2, but again he came back, converting his third break point with an aggressive return in the next game to get back on serve. Sensing the importance of pouncing on Saville when he was not at his best, Peliwo continued to aim for the lines and even to finish at the net occasionally. "The biggest thing was that I wasn't waiting for him to make a mistake as much," said Peliwo, who lost to Saville in the Australian Open boys final in January. "I was going for my shots and trying to dictate points, whereas in the previous two finals I was playing passive and waiting for my opponent to miss and give me the match, which isn't going to happen very often to guys that made finals." Saville, who has made four junior slam finals, winning two, was unable to raise his level to that of Peliwo in the late stages of the match. Broken at 3-3, Saville only had two more chances to get the break back, and true to his word, Peliwo wouldn't allow it. At 4-3, 30-30 with Peliwo serving, he hit a forehand winner, then an ace to take a 5-3 lead. After a Saville hold, Peliwo stepped to the line for the most important service game of his junior career. His service cooperated, with a good first serve giving him a 30-15 lead, and then Saville netted a backhand to give Peliwo two match points. He only needed one. With an ace up the T, Peliwo had the championship that had eluded him in his two previous appearances, and he fell to his knees in celebration, continuing to smile widely and clench his fists as he sat on the bench awaiting the award presentation. "That's exactly how I wanted to finish it," Peliwo said of his ace. "Right now it's still sinking in, so I can't believe exactly what happened right now. But it feels great. Feels great to finish that way." With his win, Peliwo will replace Saville at the top of the junior rankings, and is planning on playing the US Open juniors in September. Saville however, is moving out of the juniors, although with few regrets following his final loss. "He played well today," said Saville, who, like Peliwo, shared his Wimbledon title in 2011 with a countrywoman, Ashleigh Barty. "He was by far the better player out there, and he definitely deserved to win today." Bouchard and Taylor Townsend of the US took the girls doubles championship, with the top seeds defeating No. 7 seeds Belinda Bencic of Switzerland and Ana Konjuh of Croatia 6-4, 6-3 in the girls final, played on Court 18. Unlike the boys singles final, the girls doubles final was halted in the second set by rain with Bouchard and Townsend up a break at 4-2. The net was taken down but the court left uncovered and play was resumed without another warm-up required. Bouchard and Townsend, playing together for only the third time, held on to that break to win the first set, but trailed 3-0 in the second before Bouchard held for 3-1. That's when the No. 1 seeds stopped thinking about attending the champions ball on Sunday night, and began to bring their thoughts back to the task at hand. "We stopped talking about wardrobe and what not," said Bouchard. "This can't go three sets, we need time to get ready." "We actually started talking about tennis," Townsend added. "That was our motivation. Genie said to start focusing on holding our serve." "Every break game we had chances," said Bouchard. "Either up 30-0 or it was an ad game," said Townsend. "We both started being more aggressive, got our energy back up. We were getting pissed off, so we got ourselves back happy and bouncy again, and we started playing better." With Bouchard returning well and Townsend hitting several of her deft touch volleys, they pulled even, then broke Bencic on their second break point attempt to take a 4-3 lead. 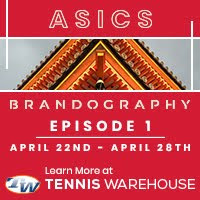 Bouchard held and it looked as if Townsend would need to serve it out when Konjuh had a 40-0 lead serving, but Bouchard and Townsend won the next four points to earn a match point. Townsend netted a forehand volley, but immediately redeemed herself with a backhand drop shot winner for another match point, which Bouchard and Townsend converted when Konjuh's forehand went wide. The celebration was subdued, perhaps because it was the second junior slam doubles title for each. Bouchard, who won the Wimbledon title last year with Grace Min, and Townsend, who won the Australian title this year with Gabby Andrews, as well as the singles, now have six junior slam titles between them. "It was a final, and you're always pumped for finals, so we were really happy with the win. Even if it didn't show, we were happy," Bouchard said. Unlike Bouchard and Townsend, who played together for the first time at the French, the boys champions, Andrew Harris and Nick Kyrgios of Australia, have played together for several years. The No. 4 seeds, who won the French title last month, added to their junior slam title collection with a 6-2, 6-4 victory over the unseeded Italian pair of Matteo Donati and Pietro Licciardi. Delayed by one of the countless rain showers that have plagued London for ten days, the boys doubles final was also interrupted by a heavy cloudburst with Harris and Kyrgios leading 6-2 and 4-3 and serving. It wasn't the ideal time for a delay for the Australians, but they managed to keep their focus and momentum. "It was obviously tough, because we could almost smell the victory," said Harris, 18. "We knew we had to come with a lot of energy with the rain delay and not be flat because of it, and that's what we did." The Italians held for 5-4 to force Harris to serve it out, but he had no difficulty doing so, with big first serves putting his opponents on the defensive, and at 40-15, he ended it with another good first serve. 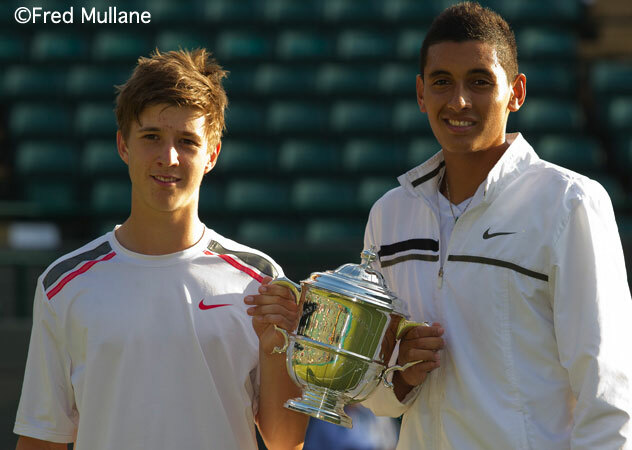 After reaching the semifinals in Australia this year and surviving some scares in their run to the French Open boys doubles title this year, Harris and Kyrgios felt they really hit their stride at Wimbledon. "We were down three match points in the quarterfinals at the French," Harris said. "But we stayed confident and composed. 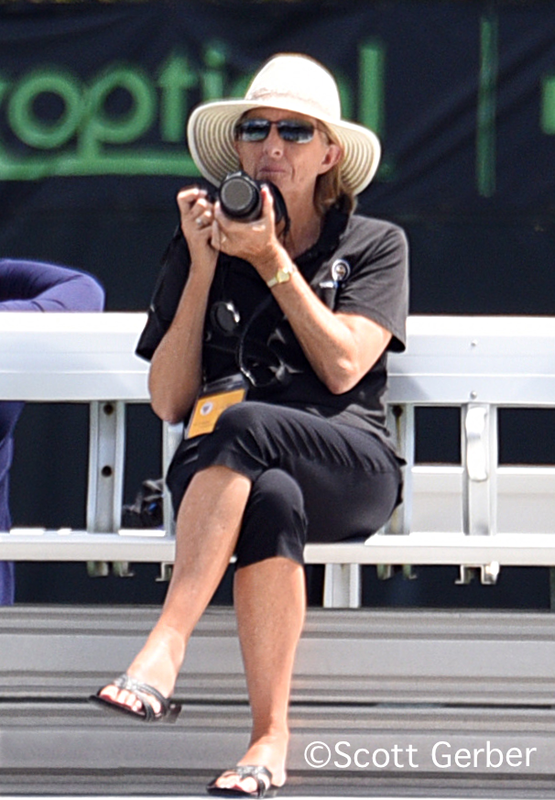 We've had our fair share of wins in close matches and super tiebreaks, so that's been good." Wimbledon is the only junior doubles championship that doesn't employ the no-ad, match tiebreaker format now used on the ATP and WTA tours, but Kyrgios believes the Wimbledon decision produces a more reliable result. "I think here, playing full scoring, it was good for us," said Kyrgios. "It took away the luck--the best players win, I guess. We didn't drop a set this whole time, and I think playing ad-deuce is great."